If you’ve followed our previous posts, you’d have seen our regular season wrap-up. During our regular season, we featured music from Shostakovich, an exploration of marches, and paid a well-deserved tribute to Leonard Bernstein. After Bernstein, we began our summer series which took us to beautiful and historic locations in Lexington, Paris, and Bardstown. 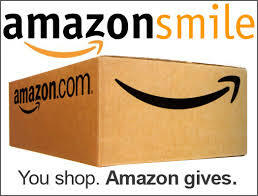 We’re so thankful for our wonderful sponsors who host us in these wonderful venues. So much music. So much fun. So much work. I was going to say we were going to hibernate for a while, but the first part of that word uses the Latin word for “winter”. After last week’s thunderstorm that left thousands without power over the weekend, it is very clear that it is not winter. And then there’s the calendar and heat and everything, too. “The band is aestivating, but will reanimate in early September.” Thank you; thank you very much. So stay tuned for announcements once we get into August. Thanks for your interest and support for successful seasons in the past, and for incredible seasons in the future! Sounds like the makings of a great summer evening to me. I know you agree. CKCB continues its Kentucky tour by performing this weekend, July 1st, in Paris at the Garden Club of Kentucky’s Wallis House. The band starts the music at 7 PM, but you can start the picnicking earlier. Our concert is free, thanks to our wonderful friends, the Garden Club of Kentucky. Drop on by to 616 Pleasant Street and enjoy the show! From Lexington on Paris Pike, once in downtown Paris , turn right on either 7th or 6th street. Go one block to Pleasant Street. The Wallis House and Arboretum are on the east side of Pleasant Street between 6th and 7th. Comments Off on Hello, Paris! The weather forecast is filled with sun, and we’re ready to provide some musical fun. Please take note of Friday’s performance location change, and please pass the word. CKCB’s Friday, June 29th concert at 7:00 PM will now be held in downtown Bardstown at the Farmers Market Pavilion, rather than at Bardstown Community Park. Coming into Bardstown on Hwy 150 from Springfield, or the first Bardstown exit off the Blue Grass Parkway, continue on Hwy 150/Springfield Road all the way downtown until you run into the old Courthouse on the Court Square. Turn right on N. 3rd Street (Hwy 150 turns north here) and go one block to Flaget Avenue and again turn right. Farmers Market is in the middle of the block on your right. Thanks to our friends at the Stephen Foster Music Club, the Bardstown Parks and Recreation Department, and their gracious sponsors, the concert is presented to you free of charge–no tickets required. Leave your week behind and enjoy a free concert to get your weekend started. The CKCB performed at Bardstown Community Park in 2017. Can’t make it to Bardstown this weekend? Bummer. But we’re here to help! CKCB will also be in Paris, Kentucky this Sunday, July 1. Check out our previous post for some info and stay tuned! Bardstown; Paris; Lexington: three cities in two weeks. Yes, the Central Kentucky Concert Band is hitting the road and embarking on our Summer Concert Series where we bring the music to you. We’re bringing some jazz, show tunes, some marches (what would summer be without marches?) and just some generally fun and exhilarating tunes to the musical table. Thanks to our sponsors, the Stephen Foster Music Club, the Bardstown Parks and Recreation Department, Garden Club of Kentucky, and the Friends of the Arboretum, you can enjoy these concerts free of charge. Bring your spouse, the kids, your grandma, uncle, and friends, and enjoy the show. Just add something to nosh, and something to keep you off the lawn, unless you like sitting on the lawn, and you’re good to go. The music will be fun, and the locations will be beautiful. Saturday, July 7, 7 PM, University of Kentucky Arboretum, Lexington, KY. In December, among other selections, we featured Shostakovich’s Finale to his Symphony No. 5, and Goedicke’s Concert Etude featuring the band’s very own principal trumpet player T.J. Thomas as soloist. In March, we marched with Trauermusik by Wagner, March to the Scaffold by Berlioz, The March from “1941” by John Williams, and the finale to Tchaikovsky’s Symphony No. 4. May came, and with that, the band paid tribute to one of the greatest American composers to date: Leonard Bernstein. 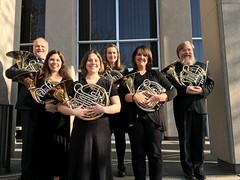 The band transferred operations to the Lexington Opera House and performed The Symphonic Dances from “West Side Story,” Divertimento (written for the Boston Symphony Orchestra on its 100th anniversary by Bernstein), and Suite from “Mass” that featured the phenomenal University of Kentucky Faculty Brass Quintet as special guest performers. The band rehearsed for these concerts practically every Thursday from early September to the day of the concert. Hours upon hours. Members practiced at home for hours honing transitions, key changes, intervals, and other technical musical elements in the selections placed there by the composers and the arrangers. Our conductor and assistant conductor put together programs, led rehearsals and made massive notations in the scores to help the band craft a holistic musical experience rather than just repeating a sequence of tones. The musicians in the band worked very hard to perfect this expression, too. Band members moved chairs, stands, and percussion equipment. Family members took care of family business while band members rehearsed. Family members also provided financial and emotional support. Crews at the band’s venues (Transylvania University and the Lexington Opera House) configured stages, provided lighting, sound, and assisted with the heaps of paperwork that goes into putting a performance together. During all of this, a special committee was formed and, with the band’s input, rewrote the band’s bylaws and organizational structure to ensure the band’s continued vitality and continuity for the next several decades. Books were balanced; attendance taken; music was purchased, borrowed, begged for, collated, distributed, and refiled and returned; performances were negotiated, documents signed, meetings led; equipment managed; sponsors were secured; websites and social media were administered; original poster art was graciously provided, minutes taken and communications made. We made new band friends, and said goodbye to longtime band friends, as well as band friends who we didn’t get to know as much as we would like before circumstances separated us. Throughout all these labors, what unites us and makes us a family is this: a love for hearing, making, and sharing music. That’s really it. 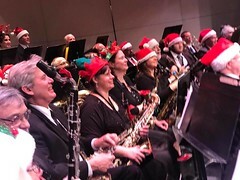 Through the generosity of our sponsors, band members, family members, friends, and associates, we are able to offer the audience the gift of music. It’s easy to overlook the value of this gift, as one cannot take it home in a bucket, or park it in a garage, or hang it over a fireplace. But the power for change–such as emotional, political (just ask Shostakovich, whose very life depended upon pleasing Stalin through his compositions), and cognitive (research is providing many insights into the interaction of performing music on developing and developed brains) afforded by music is undeniable. On behalf of the band, I thank each of you for your contribution to the band’s mission, whether you are a valued audience member, band member, family member, sponsor, venue affiliate, or have in any way forwarded our band’s mission. Playing Bernstein’s West Side Story this last concert has given us an insight into the possibilities of story-telling through the emotional, social, and perhaps innate sensibilities we possess of making music. Each of you has written a note in the score that tells the story of our band. We have been composing this score for over 40 years, and we do not yet see the double bar line. But wait…there’s more. Although we’re finished with our “regular season,” we have three more concerts this summer scheduled so far: Friday, June 29, 7 PM, Community Park, Bardstown, KY; Sunday, July 1, 7 PM, Wallis House, Garden Club of Kentucky, 616 Pleasant Street Paris, KY; and Saturday, July 7, 7 PM, University of Kentucky Arboretum, Lexington, KY. Check back here and on our Facebook page for additions or changes. Comments Off on Crafting the Score. I was a bit enthusiastic to break out my edition of the Riverside Shakespeare to review these lines. So where am I going with this? 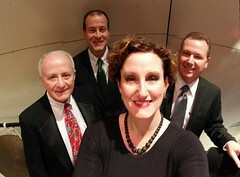 If you’ve read the previous blogs, you know CKCB is presenting many of Leonard Bernstein’s most loved selections on May 6 at 3 PM at the Lexington Opera House. One of the most well-known of his works is West Side Story. That Broadway play itself was informed by Romeo and Juliet. (R&J was itself informed by a 3,000 line long poem–thanks, Riverside–so nothing is new in Hollywood, Broadway, or Verona, for that matter.) But a great play is a great play, and great music is great music. Les Anderson is the assistant conductor for CKCB and will be conducting Bernstein’s Symphonic Dances from West Side Story. When announcing the Bernstein playlist, Anderson was enthusiastic about conducting the piece. The band has been working very diligently on this selection. Bernstein’s mastery of sound and musical story-telling translates into very specific musical markings–entrances may be anywhere in the measure– and features many musical styles, instrumental “special effects” and unconventional time signatures. The CKCB is ecstatic to welcome quintet members Jason Dovel and Abby Temple on trumpet; David Elliott on horn; Bradley Kerns on tenor trombone; and J.D. 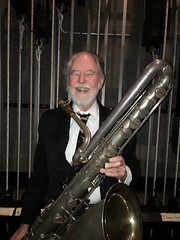 Handshoe on bass trombone to the Lexington Opera House to perform Suite from Mass with the band. Hawkins places much thought into programming the music for the concerts. He considers both the educational and aesthetic experience of the band, and the general enjoyment and spectacle of the selections for the audience. Even though things didn’t work out for Romeo and Juliet, or Maria and Tony, for that matter, the CKCB guarantees a great afternoon of Bernstein. But please, if you are of the House of Capulet or Montague, or a Shark or a Jet, rumble after the concert. Interested in joining us for an afternoon of music? 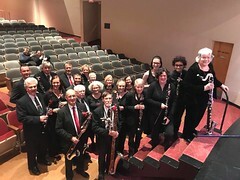 The Central Kentucky Concert Band will be performing many selections by Leonard Bernstein on Sunday, May 6 at 3 pm at the Lexington Opera House. Admission to the concert is free and no tickets are required.